I've just cut the grass in my back garden in Glasnevin but it was mainly cutting some daisies; there was no real grass to cut. It was very dusty as well. It's 20.5C now and the haziness has cleared to leave clear skies. There's a gentle breeze masking it feel quite pleasant. I go to Sardinia every summer, where all grass vegetation is whitish yellow in summer, but it's starting to look that in places here now too. Certainly come this time next week it will. Everything here is green and lusty. We got that deluge last week and this is a pure bog area anyways. West Mayo offshore island. Not looking great for rain. Sunshine totals (hours) for Irish stations from the 21st-23rd June 2018. Shannon Airport and Cork Airport reigning supreme so far. Some very high totals already with more than 40 hours at multiple stations just for this 3-day period alone. 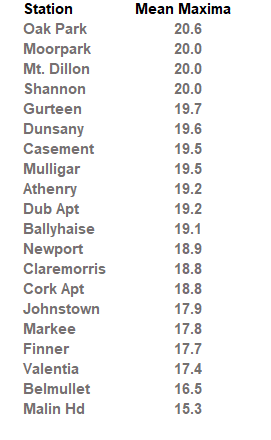 Table showing the mean max at most of the reporting Met Éireann stations for the month of June so far (data is up to yesterday). 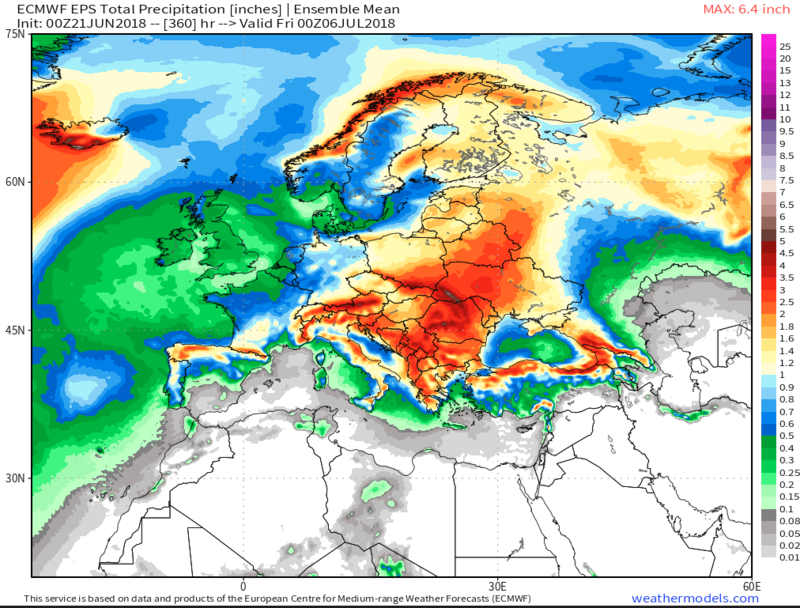 This it is a possibility now that most stations will finish with the monthly mean maxima of above 20c, and possibly well above at some of them. This has convinced me to not cut my lawn to give it some protection, neighbor cut his yesterday and his front lawn is similar to this, mines a bit messy but a lot greener. In this house 3 summers and first time I've seen clover on it. Lots of other flowers aswell. People are clueless, don't cut your grass! During drought best to leave it at about 5cm long as it's not growing and can't repair itself. Well at least raise the height of cut up to the last on the mower. You can have a neat lawn and still a nice bit of length in the grass. I put out FeSO4 and some fertilizer before the dry spell and have been watering a few times a week. Grass is a lovely deep green. Neighbours plot is fried! Cut too low and zero watering. The missus showed me a video of the forest (Coolmeelagh Woods) on fire on the Carnew to Bunclody road this evening. I wouldn't waste good water on grass; water your flowers by all means, but not grass. 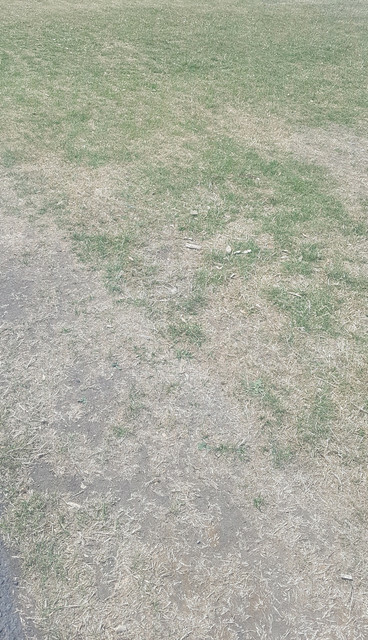 It looks dead, but nothing kills grass. First rain will bring it back to life. cycled past Roundwood reservoir this morning - it didn't look particularly low (and I've seen it low in the past). Felt less guilty watering the plants this evening.